Edmond Memorial wins City Championship for second straight year! 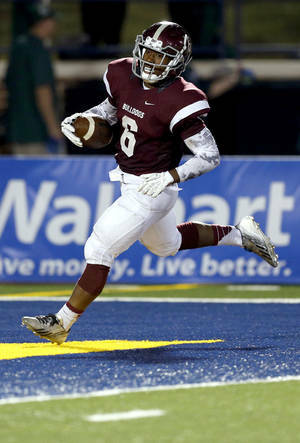 Edmond Memorial star running back Warren Wand remained relatively quiet through the first three weeks of the season. Sure, he had two touchdowns. But he was still regaining his form after missing nearly the entire preseason with a quadriceps injury. Wand definitely looked like his old self Friday when the Bulldogs won the city champoinship for the second year in a row. He accounted for five touchdowns and 294 total yards while leading injury-decimated No. 8 Edmond Memorial to a 40-33 win over No. 9 Edmond Santa Fe in the team's District 6AI-1 opener at Wantland Stadium. "This week is the best I've felt," said Wand, who is verbally committed to Arkansas State. "I just felt conditioned and ready to play. We had good vibes, but we didn't know how it was going to go." Edmond Memorial is now 3-1 on the season and the city champion with a 2-0 record in Edlam games, but more importantly it has an early edge on Edmond Santa Fe in playoff seeding among a loaded district that includes highly ranked teams Westmoore, Jenks and Broken Arrow. Getting that edge took a little extra work. The Bulldogs entered the game heavily depleted with four starters out due to injuries — including senior leaders Jason Hand and Kourtney Williams. Then they lost three more players to injury throughout the game, along with dealing with minor injuries players played through. "We overcame all those things and we got a ‘W' against a great team, and that's why I'm so proud of them," Edmond Memorial coach Justin Merideth said. So getting the ball to Wand was crucial. "The big thing was we needed to get him the ball out in space because we had so many injuries on the line," Merideth said. "And let's be honest, he was just special tonight." Wand was spectacular in the second half, rushing for 143 yards and accounting for three touchdowns, helping turn the Bulldogs' 19-14 halftime deficit around. Quarterback Mick Mayerske put the Bulldogs ahead early in the third with a 19-yard run following a 33-yard run on third-and-28 from Wand. Wand then followed that up with a 9-yard score before scoring twice in the fourth quarter on a 12-yard reception with 3:21 left and a 36-yard run with 1:05 left. "The O-line did a great job," Wand said. "It was a team effort. We knew we had some key guys out and we just had guys step up. Our second-teamers got in in practice and they worked hard. They came to play and we never gave up." Wand, who scored twice in the first half, finished with 183 yards on 26 carries along with 111 yards receiving on five catches. He overshadowed another impressive performance by Edmond Santa Fe junior Darran Williams, who rushed for 295 yards on 33 carries. He scored two touchdowns on runs of 45 and 60 yards. Edmond Santa Fe (2-2) also got two touchdowns from the combination quarterback Keaton Torre and receiver Kaden Mendenhall, including one as time expired that made Wand's final touchdown even more important than expected on a special night. "That's why you can't quit and can't give up on a play," Merideth said. "And again he's really special."